I know it’s been a while since my last post but this wintry weather sent me into hibernation. Not to mention, I’ve been eating a diet consisting of ginger bread, sugar, and chocolate chip cookies. Ok, just kidding about the last part….not really. On a day like this in Northern Virginia, when the wind is blowing, there is snow on the ground, and the temperature drops below 20 degrees, I want nothing more than a big hot bowl of soup. However, I would gladly swap with someone who lives in say Tahiti where the breeze is blowing, there is sand on the ground and the temperature drops to a cool 60 degrees. Any takers? 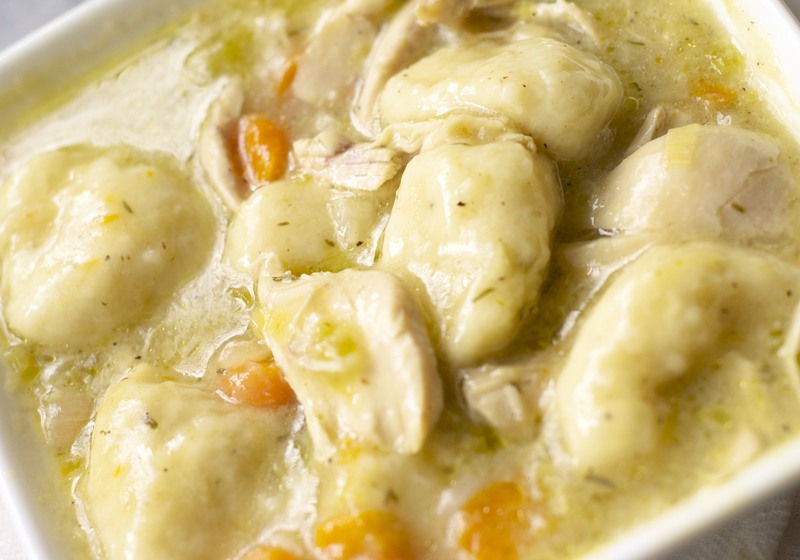 Well, I’ll be waiting for your call, but in the meantime how ‘bout some chicken and dumpling soup? It’s hearty like chicken noodle, and is almost like the filling of a chicken pot pie. Perfect for weather like this, because baby, it really is cold outside.